How to make canned peaches – our 100 year old South African recipe. Life is better than death, I believe, if only because it is less boring and because it has fresh peaches in it – Thomas Walker. I have a vivid image of Sunday lunches that fill the memory of my childhood… Sitting around the dining room table with my parents, my brother and myself enjoying my mother’s handy work. The table was stacked with the local butcher’s best roasted beef, our down-the-road grocers’s sweet potatoes and rice and my favorite: butternut with cinnamon and sugar. But the best was always served after lunch……….. canned peaches for desert. Those thick slices of gold in glass bottles, screaming to be opened. But the best is not always in the eating – but often in the making. For the last 14 years we’ve gone to Great Brak River for holiday. A small coastal town in the South Cape in South Africa’s picture perfect Garden Route. One of our days were always dedicated to canning local fresh peaches. It is usually a mission to source enough peaches and it is left up to my dad to do the scouting in nearby George and Mosselbay to negotiate with vendors to get enough fresh, ripe peaches from nearby Calitzdorp. My mom always plans out the day in great detail, all guided by my Great Grand Mother’s recipe (Please see the pic below). My mom made sure everyone knew who was responsible for what and made it clear that there will be no laying around or going to the beach that day. The day is filled with pealing and cooking and moaning (mostly because our hands cramp up and thanks to murphy, it’s the best summer weather we’ve had in ages, but no swimming for us……it’s peach day). 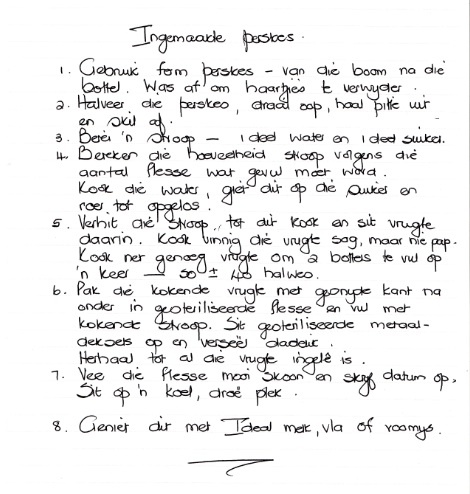 So I decided to share my Great Grandmother’s 100 year old recipe for making truly South African canned peaches. It was handed down from my Great Grand Mother to her daughter and then to my dad. I hope you get as much joy from it as me and my family has for over 100 years. Please do share with us your fondest memories about sunday lunches and about canned peaches…..if you have any. – Cut all peaches in half and remove pips. 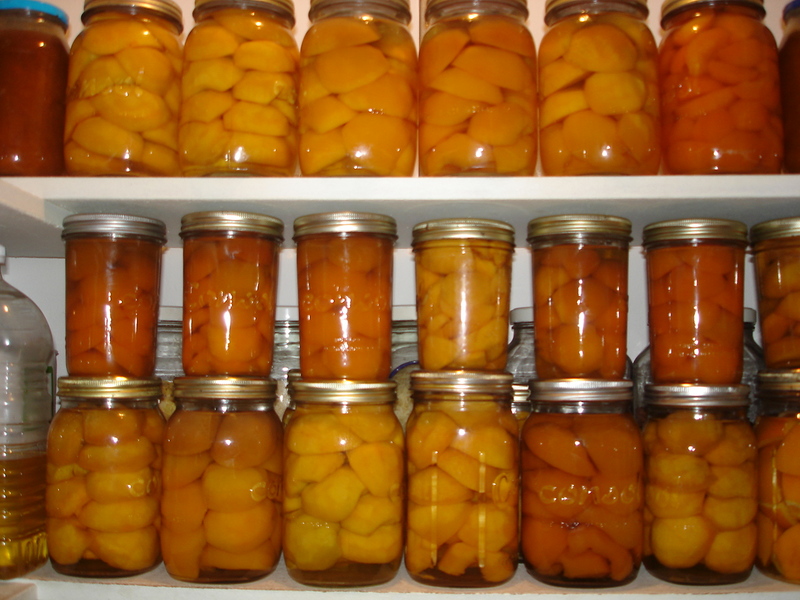 – Put peaches (the side that was cut facing the bottom) into sterilized jars and then fill with cooked syrup. – enjoy with ice cream or custard or any way you like! Next Post First Architect drawings on its way! – What should we choose?